The Network of organizations which make up and support the Be Basque Dual Career Centre keeps growing. The collaboration platform of professional women interested in entrepreneurship aimed at having a social impact, MET COMMUNITY Bilbao, is the latest to join the extensive network of collaborators after signing the accession agreement. The Be Basque Dual Career Centre is a pioneering initiative largely supported by the European Commission and headed by Bizkaia Talent to provide advice and personalized guidance to the partners of highly-qualified staff so as to achieve their adequate professional and personal integration in the Basque Country. Thanks to this accession and collaboration agreement signed by the managing director of Bizkaia Talent, Ivan Jimenez, and the MET Community Bilbao director, Virginia Gómez, the entrepreneurial spouses from the Relocation service, which coordinates the Be Basque Dual Career Centre, will receive support in the implementation of their projects. The centre will provide a new view on the innovative processes as well as encouragement and inspiration and will connect the female entrepreneurs with the entrepreneurial ecosystem. 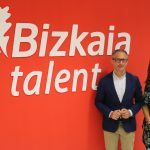 The managing director of Bizkaia Talent insists that “in the next decade the demographical changes in the Basque Country and the shortage of labour, especially highly-qualified workers, could have a negative effect at the social and economic level if no solutions are implemented”. Moreover, “this is worsened by the fact that the new jobs require and will increasingly require high level qualifications for most jobs and all occupational categories”, Mr. Jimenez adds. By signing the accession agreement, MET Community joins other Basque organizations such as ALDALAN, BEAZ Bizkaia, BOLUNTA, CAMPO & OCHANDIANO, Traders Confederation of Biscay, PROFESSIONAL ASSOCIATION OF CIVIL ENGINEERS, Official Association of Chemists and Chemical Engineers of the Basque Country, Burgos and La Rioja, Basque Association of Economists, Emakume Ekin, ICAZA Colaborando (Ner Group), Parque Tecnológico – Teknologi Elkartegia, S.A., UNIVERSITY OF DEUSTO, ieTeam, Professional Women Network Bilbao, Bilbao Ekintza and Institute of Competitiveness – Orkestra Crecer+.